Away fans are normally located within the upper tier of the Bramall Lane Stand, which offers a much improved view to the lower stand where away fans were previously located. When Bramall Lane had terracing, the option of sitting in the aforementioned upper tier provided one of the best views at any visiting ground. M1 to J34 and take the A6109 Meadowhall Road signposted Sheffield. Continue for 3m until this road merges with the A6135, then bear right onto Bonk Street. Take the fourth exit at the roundabout onto the A61. Go past Sheffield station and take the first exit at the next roundabout, keeping in the left-hand lane for Suffolk Road. Take the fifth exit at the next roundabout into St Mary's Road, signposted Bakewell, and left at the next roundabout into Bramall Lane. The ground is on the left. M1 to J31 or J33. From J31, take the A57 and from J33 take the A630 until the two roads merge. Continue along the A57 into Sheffield, take the third exit at the roundabout onto the A61, then as north. A57 into Sheffield. Just after the university is a roundabout, take the fourth exit into Upper Hanover Street. 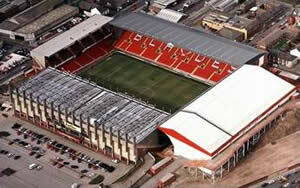 Turn right at the second roundabout into Bramall Lane and the ground is on the right. Sheffield Midland - 10 mins walk long Shoreham Street. Plenty of street parking. Also a car-park at Sheffield station and by the roundabout on Upper Hanover Street. Parking at the ground is for permit holders only. Located in Alderson Road, off Woodhead Road, this pub is a 5 mins walk from the away entrance. The landlord positively encourages away fans and requests that you phone in advance, 0114 258 1640, so he can have things ready for supporters. The Royal Standard is a good bet for both sets of fans. Located directly opposite the station, and is a convenient stopping place, serves excellent food. Located in Abbeydale Road, is in a predominantly student area and has a great atmosphere complimented by some fine real ales. If you are a registered user then you can login, and create your own personal review of Sheffield United Football Club - Bramall Lane. These reviews can be private or public.